Akatsuki – Though by now its main antenna is probably brown or black from being baked by the sun – Powered by a NEC uPD55117B-018 16-bit processor. 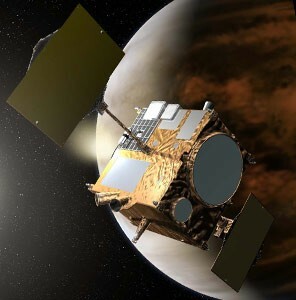 Akatsuki, Japanese for Dawn, was launched in May of 2010 for a journey to the morning star, Venus, on a JAXA H-IIA rocket. The H-IIA flight computer runs on a space rated version of the NEC V70 32-bit processor, running the NEC RX616 RTOS. A processor significantly faster than that of the interplanetary probe it was launching.